Writers on the subject of emeralds dutifully recount the “magical” properties and quaint superstitions surrounding emeralds. They feel the need to repeat every story, including that of Emperor Nero at the Roman coliseum, looking through an emerald crystal to soothe his eyes. Rather than repeat old stories of lore, I choose to go directly to romance. The stories that follow are all true. Some names have been changed to protect privacy. Romance goes hand in hand with emerald in Colombia, where men and women in the trade have been mesmerized by the promise of the gem’s green allure. Pierre was one of many traders who came a few times a year from Europe to the emerald market in downtown Bogotá, the capital of Colombia. He was bald, tan and fit but seldom expressed emotion and focused only on obtaining hard-to-find, high-end emeralds in a seventh-floor office at the Emerald Trade Center. Sometimes patient, sometimes impatient, he seldom deviated from his buying activities. During the mid-1980s, when the sister of an emerald cutter began brokering emeralds for him, the emerald trade in downtown Bogotá ceased to be a man’s world. Soon she invited her girlfriends, and in a few years almost half of the comisionistas (emerald brokers) in downtown were women. Sandra. Since the late 1980’s, emerald brokers in the downtown Bogotá emerald markets began to include ladies as well as men. Now, over 50% of emerald brokers are women. Lorena was one such woman. A dental assistant from the east side of Bogotá, she accompanied her sister, a comisionista, one day as she brokered emeralds. Lorena was fascinated by the buildings, the offices and the different nationalities of emerald buyers. After seeing her sister earn more in one week than she made in a month, Lorena turned in her pink apron and scraper and never looked back: she was a comisionista now. Selling was easy for her, and she liked the constant change and interaction of dealing with the emerald owners and buyers, trying to make an accord between the two. Lorena had a beauty not often seen outside of Latin America: jet-black wavy hair with a shiny luster, dark skin and an exotic indigenous profile of lips, nose and forehead. Like many beautiful women in Colombia, she kept her attention directed inward and her eyes downcast: she was a Catholic and was her mama’s good girl. Lorena’s success at her new career brought in two more relatives to be comisionistas: her cousin and another sister. The resultant celebration ended with Lorena getting a tattoo of a small emerald on the middle of her upper arm. It was quite a party: even a small tattoo is quite risqué in Latin America. As Cupid would have it, the day Lorena walked into the office where Pierre was buying, she happened to have on a sleeveless blouse. To a Frenchman, all morenas, or dark-skinned Latin girls, are highly attractive, but that had never distracted Pierre on any previous buying trips. What threw his detachment out the window that day was the emerald tattoo on Lorena’s arm. He too had a tattoo, also on his upper arm. In Pierre’s case, the tattoo was a reminder of his distant past when he was young, idle and irresponsible (and seemingly happier). He went through the ritual of opening the stone papers and viewing the emeralds with her, not finding any he needed. The meeting ended too abruptly, and Lorena was out the door as the next broker came in. Pierre wished he hadn’t let her leave so fast. For two days Pierre was tormented by the thought of that emerald tattoo. He had to see her again. His orderly and businesslike mind was not accustomed to being upturned in this way. “Oscar,” he asked his associate, “who was the lady with the cabochon emeralds and the large emerald cut? I want to see her again.” He made it sound as though he had a business reason for asking about Lorena. Oscar called her back the next day. Lorena’s big eyes were more observant than one would guess. She knew from the first meeting that something was happening with this Frenchman. As she walked in for a second time, she was like a skilled poker player. She contained the spark in her eyes, keeping them downcast (except for one quick searching gaze) and letting the game play out. Boundaries were being broken in Pierre’s mind, and he knew that he would not let her leave this time without signaling his intentions. His advance and her response were mere formalities; waves of attraction were crashing the walls of propriety now, foundations were shaking. That evening, a few things happened that were considerably more risqué than the tattoo. Oscar and I miss Lorena. We still wonder what happened to her and her dog named (this is no lie!) Larry. She lives in Europe now, in Paris. She was not the first Colombian beauty to be taken back home to some foreign land by an emerald dealer, nor will she be the last. More strings wait to be pulled by the spell of the emerald. Bruno became fascinated by emeralds soon after he graduated from the University of Naples; he was half Italian and half Colombian and decided to make a career of international gem trading. One day, on a train from Milan to Valenza, he happened to be sitting next to a cute young student from Sicily named Sara. After many stories and laughs, his youthful bravado and her innocent charm pried an emerald from his possession, which he gave to her. It was just a small pendant in 18k gold. The purity of this gesture was in the fact that he didn’t request her phone number or address in return. My eyes were opened to the world of collecting one day when I was walking past the famous corner of Jimenez and Septima (Seventh Avenue) in downtown Bogotá. It was 1985, the third year of my endeavor to become an emerald dealer. I had little money but made up for it by borrowing diamonds in the downtown Los Angeles jewelry district and trading them for emeralds in Colombia. The ’80s were the formative years of the now-colossal Indian diamond industry, and the Indian diamond dealers in L.A. gave up to 90 days’ credit to anyone who showed reliability and consistency. This meant that after a ten-day trip to Bogotá, I had almost 80 days to sell the emeralds I had traded for, collect the money and pay back the diamond dealers. During those days in Bogotá there was an old second-story café called El Mosaico where the emerald dealers would sit and deal emeralds to each other and have coffee (called tinto). Next door was a barber who had a carat weight scale, an old hand-held metal one with small cups on chains and tweezers to move small weights back and forth. He would charge twenty pesos to weigh an emerald for any of the esmeralderos who needed it. Those were my “trading days,” and I made deals again and again between La Septima and El Mosaico. During the first year, it dawned on me that being a polite, sensitive Californian was not making things any easier for me on the streets of Bogotá. Nobody responded to a civilized demeanor. Even in downtown Los Angeles where I started my business, I was noticing that same thing. An old Jewish gem dealer on Sixth And Hill Street once told me: “Ron, you’re too nice for this business!” I took his criticism personally and dwelled on it. I applied this lesson on Jimenez and Septima. As I walked past men inspecting rough or faceted emeralds in small groups, rather than politely request to see the stone, I would just barge in—my mind screaming, “Ron, you don’t even know these men!”—and poke the one with the stone with my finger. “Muestre a ver.” Show it to me! Amazingly, the men would turn to me as if my behavior were the most normal thing. “Cuanto?” I would ask them. How much? On this day in 1985, I walked past three men who were inspecting a large emerald crystal. Still feeling self-conscious, I steeled my nerves and barged in to see it. “Muestre a ver.” I got the usual response: momentary surprise, and then acceptance. Colombians were always pleasantly surprised to meet an American who had learned their language and culture. It was easy to get the price and terms down to my satisfaction. I had never bought such a large rough crystal before—50 carats—and they were patient as we went to the bank to cash a check I had from selling diamonds. Then it was off to the Mosaico to weigh 13 more carats of diamonds to complete the almost $8,000 I paid for the piece. It was worth more as a specimen than as a cuttable piece of rough. 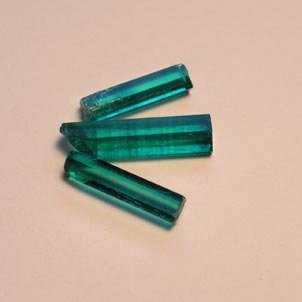 Collectors don’t usually want emerald crystals to be gem-quality because it would make the price skyrocket. 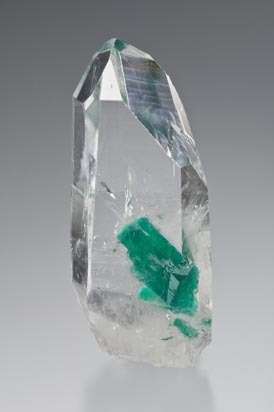 What they want is crystal form and good color. It is the form, a flat-sided hexagon with no chips on the termination, that makes a crystal desirable. When it is embedded in an attractive matrix, the desirability goes up even more. 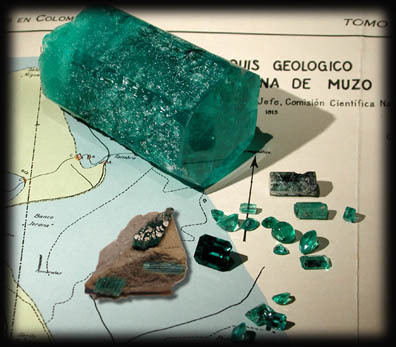 A 1600 carat emerald from Coscuez Mine in the Muzo region. The map is from 1910.